I first dipped my toes in to the Peer to Peer lending market back in 2010. Back then I was just dabbling and transferred $2,000 into my investment account over a 6 month period. Looking back at the history it looks like this initial investment was made up of 5 separate deposits. I don’t really remember what put P2P lending on my radar, but I do remember finding it intriguing…obviously it was interesting enough for me to divert some capital over to a P2P platform. 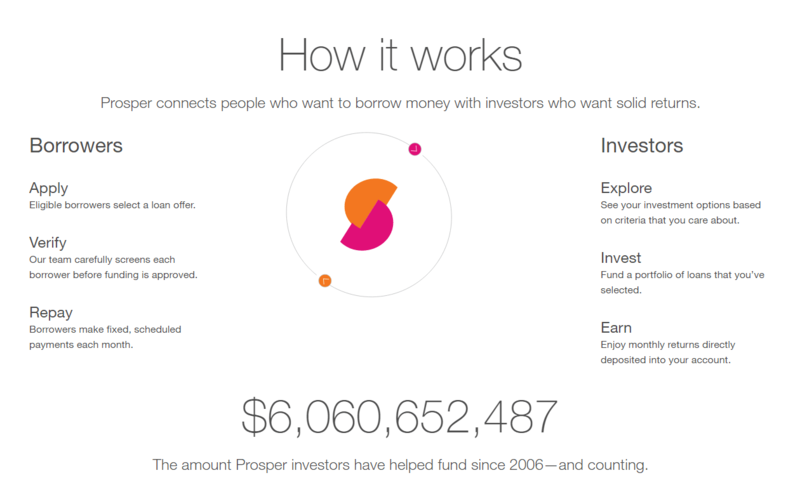 Prosper was the first platform I found that facilitated such P2P lending activity. I am pretty sure Lending Club was around at the time as well, but I chose to invest my capital using the Prosper lending platform. You can see from the above screen capture that I made my first deposit in February of 2010. I was interested, but much of my free capital at the time was going to invest in the stock market, as we were still less than a year off the March 2009 lows. Therefore, I was not willing to divert much capital this way. 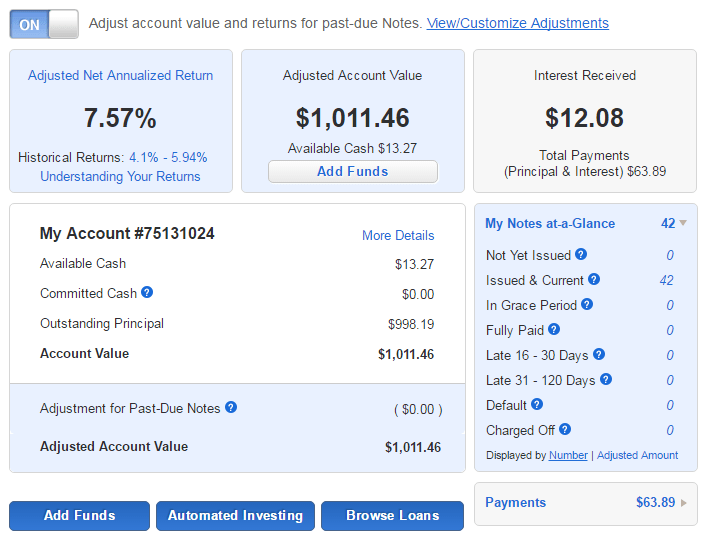 After depositing a total of $2,000 with my last deposit in 2010 I set my Prosper account on auto-pilot. I didn’t even check in on it that often. Then Prosper introduced a trading platform that created a secondary market when you could actually liquidate the loans you were invested in before maturity, which I believe back then were 1-3 years in duration. So, of course in April of 2011 I had to test this new platform out to see how easy it would be to liquidate my loans. I was curious what kind of haircut I was going to have to take to liquidate early. By July 11 of 2011 I had completely liquidated my loans. To my surprise I took a haircut on some, but was some how able to get a premium on others. In the end I think I ended up taking about a 1% haircut on average. After completely liquidating my loan portfolio, I transferred my original investment of $2,000 plus the accumulated interest of about $100 out of my Prosper account and into my checking account. In 18 months my P2P lending career was over. In that time I did have 3 loans get sent to collections and eventually they were charged off. I honestly can’t remember what my thinking was at the time, but P2P lending would not cross my mind again until sometime in 2015, when I decided this was an asset class that deserved a permanent allocation. As we approach about 500 words into this post I am realizing that some of you reading this may not even know what P2P lending is. I won’t spend too much time here, but lets review this briefly. Peer to Peer lending is just like it sounds, as an investor, you are loaning money to borrowers. P2P platforms like Prosper and Lending Club make this rather easy. They have built an auction process where borrowers apply for loans and investors bid on those loans. As an investor you can invest (bid) in as small as $25 increments, so you can build up a pretty diversified portfolio quickly. Whether you invest with Prosper or with Lending Club, they both offer a rating system that buckets each loan based on the risk level (the same way a bank would classify risk). The riskier the borrower the higher the interest rate, but also the higher probability of default. And lastly with both platforms you can invest manually, handpicking the loans you invest in, or you can automate your investing. I am a big fan of the automation route. What Does My P2P Portfolio Look Like Today? In 2015 I jumped back into the P2P lending space and currently have an account with both Prosper and Lending Club. Although currently I have the majority of my P2P allocated capital at Prosper. Last year when I put together my blueprint to $10M in net worth, I decided that P2P lending should play a role and should account for 5% of total net worth. Currently I have only invested $6,000 to date. In order to reach a 5% allocation based on my current net worth I am going to need to continue to build this to around $22,000. At this point I don’t really know how fast I will allocate capital here in order to achieve the 5% allocation goal. With that said, lets take a look at my current summaries for both accounts. You can see from the above screenshots of my P2P accounts that in 2016 Prosper is earning about a 5% return and Lending Club is earning about 7.6%. I think the disparity is really a function of how seasoned the investments are. I fully expect my Lending Club returns to fall closer to 5% over time. There will eventually be charge offs at some point. I only have about $6,000 invested and based on my $10M blueprint I should be increasing this to about $22,000. I have the money, but why don’t I increase this to $22,000 immediately? Well, the thing I didn’t contemplate when I was formulating my plan, was taxes. 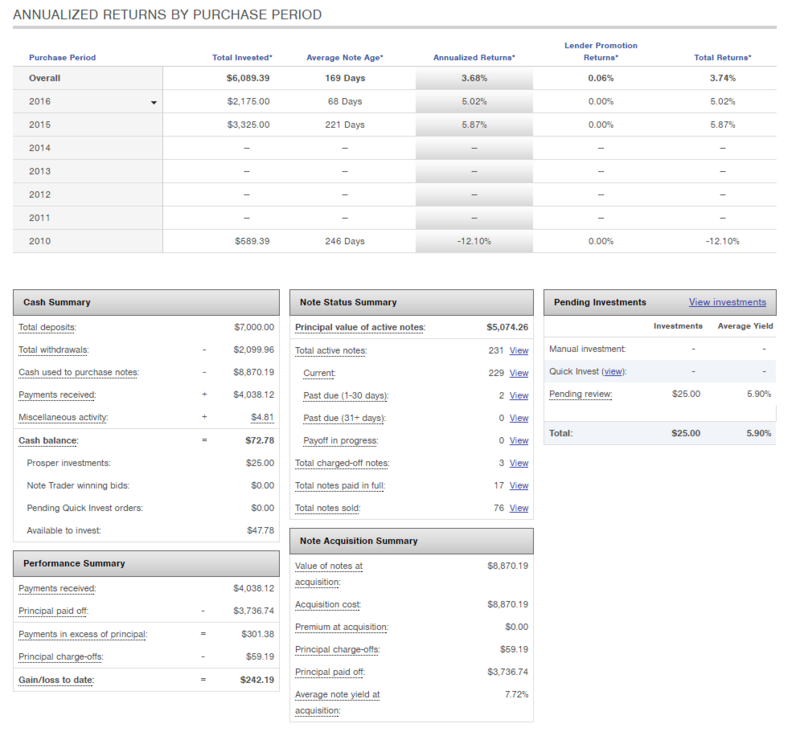 The returns from my P2P portfolios are taxed at ordinary income rates. If you read my recent post on how I plan to increase my income to $600K/year, then you will remember that one of the things I am trying to do is divert more capital into more tax efficient vehicles. We are approaching a marginal tax rate of ~54% and I would like to invest in assets that are going to help dilute that. All this to say that we are going to focus on a more tax efficient investment next, and it will require a significant portion of our capital. I am also contemplating whether I really need to spread my P2P capital across multiple platforms or not. The good news is that with apps like Personal Capital, it makes it easy to keep on all your accounts in one place. I agree with your conclusion. Given that you’re in your peak earning years and have such a high marginal rate, it’s really hard to accept a return that gets taxed as ordinary income, particularly since it’s not like you need the interest money for living expenses. The obvious solution is to move this P2P lending component of your portfolio into your Roth IRA so it can grow tax free. It looks like Prosper will let you open up or transfer an IRA, so probably the easiest thing to do would be to transfer part of your Roth IRA balance to Prosper and invest from there. Josh – I have this on my list of things to look into, thanks for the comment. I thought about this some more and am wondering if a Roth IRA makes the most sense. You’ll need to run the numbers (which I’m sure you would have done anyway) but with a Roth IRA, sure you won’t have to pay taxes on income from the P2P lending, but you’re also not going to make much money from this asset class. You might be better off having stocks in your Roth IRA and taking the tax free growth that they’ll provide as they compound in value over your investing career (plus, no RMDs for Roth IRAs). Maybe it makes more sense to use a Traditional IRA for a P2P investment, since you’ll eliminate the tax drag and only pay taxes later at whatever your effective tax rate will be in retirement. Either way, something to think about. We’ve been investing with Prosper for a while now too. Here is a post on our experience, and our specific returns. Thanks for sharing your experience Brad! It’s always fun to experiment, but as an asset class p2p-lending doesn’t have much of a track record. That alone would stop me from ever taking it more seriously than an experiment. I’m looking forward to hearing more about your tax efficient investments – you know I’m a fan of rental properties! Brian – not sure i agree with that statement even though it is repeated often in the PF circle. P2P lending is no different then personal non asset backed loans which banks have invested in for 100s of years. I agree that there is a lack of public performance data on the asset class, but i expect the big banks have plenty of data on it to base their pricing on and they have continued to offer it, so they think it has substantial profit potential at least. What? Lending Club makes ALL of the loans and their performance publicly available, and they are in a format that lets you back test any filters you want to build. You’ve listed a huge con that’s prohibited me from dipping my toes in P2P lending, it’s not tax efficient. Since our household income ranges from 230K-320K, minimizing current and future taxes is an obsession of mine. I feel like it’s the best return on investment because you’ve already guaranteed a positive return on the taxes you save and whatever gains on the actual investment are bonus. I’m also wondering about your opinion is on P2P in a rising interest rate economy. I was reading somewhere about someones perspective that rising rates would cause more defaults on loans. Honestly, I haven’t researched P2P seriously because of the lack of tax efficiency, but my simple mind thinks rising rates would draw more loans because people would be looking for a slightly better rate than conventional sources. Would love to read your thoughts. I believe it has changed too drastically from the loans banks have given for hundreds of years. The recent explosion has made it much easier to get a loan – has that changed the quality? Just thinking about how it is often marketed, many use it to refinance credit card debt – fills a need in the market, someone should do it, but personally I wouldn’t do >10% of a portfolio. Just me! Peer to Peer lending is so innovative. I’ve been wanting to try it out but haven’t gotten educated in the space yet. I’m going to try to do some experiential learning and commit a few thousand dollars into it once I have time to invest some excess cash that’s not 401k. Out of curiosity, did you use any materials or read up on the subject of consumer lending before investing in the platform? Finance Solver – I read some blogs and reviewed as much information as I could on the different P2P sites out there. At the end of the day it is consumer lending that has been made available outside of the big banking institutions due to technology once again disrupting the industry. I am not too concerned with the short track record of P2P lending. But that said I have only allotted for up to a 5% allocation of total net worth in this asset class. Thanks for sharing this and congrats on “dipping your toe in”..
Jef – In my original blueprint (which I will be revisiting asset allocation in 2017) it calls for 5% of net worth to be allocated to the P2P asset class. We will see how that goes.